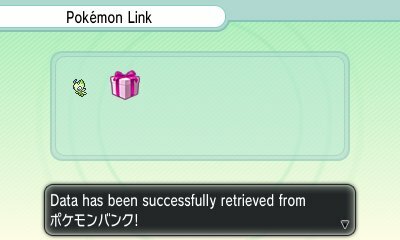 Pokémon Link is a feature, akin to the Unova Link feature in Pokémon Black 2 & White 2, that is used to transfer a variety of aspects of various Pokémon download titles that are installed on the 3DS. 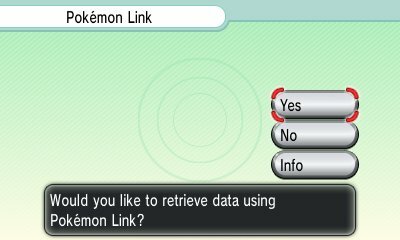 After Pokémon X & Y has interacted with one of these titles, the Pokémon Link option appears on the main menu of the game. From here, you can enter Pokémon Link and get access to the feature. Unlike Mystery Gift there is not a multitude of options, but rather a simple Yes or No interface which allows you to receive whatever the 3DS download software has stored for the game. When you select Yes, you will be moved to a page that gives you a list of what is pending for download into your Pokémon X & Y game, and lets you double check if you wish to download it or not. If not, it will remain there until you download it. Any of the downloads will go immediately to where they need to. For example, if you received PokéMiles and Battle Points, they will immediately be added to your total whereas if you get a Pokémon through the Pokémon Link feature, it will be placed in the first free spot in your storage box in the game. If any items are to be distributed through this manner, they will be placed in your bag. Pokémon Bank uses this system to distribute its special Pokémon. Click here for a list of Pokémon Bank's downloads.